On special occasions, my go-to is a little black dress with lace up platforms and a clutch, but as Winter is approacting us pretty fast, it's no longer weather-appropriate to be going out without a jacket, or even bare legs for that matter! So today I decided to style more of a dressy outfit that's perfect for Autumn or Winter, that works for weekend cocktails or a smart/casual meal. I'm super excited to show you guys a couple of new additions to my wardrobe today! Probably the most obvious one to start with is this floral jacket from Style We, and I just can't get over how pretty it is! It's a little on the pricier side than my usual Ebay bargain finds, but the design, material, fit and colour matches my style so well! I don't really own a formal jacket, and this statement longline blazer is a little out of my comfort zone, yet a welcome addition to my collection. 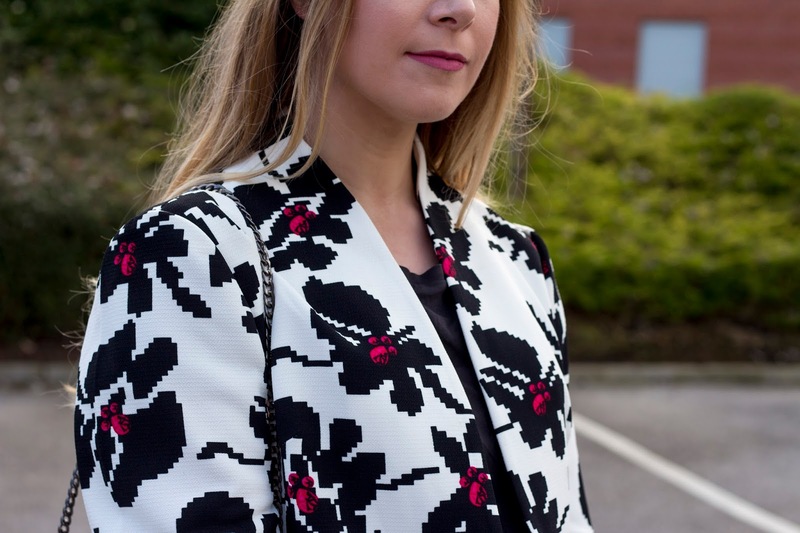 With the print being monochrome with just a hint of red, I can see this jacket being super easy to style with a lot of colours. I'm thinking a black or white dress with coloured accessories is going to be my go-to with this winter jacket! Next up, I have this gorgeous cluch bag from Koko Couture. Bags aren't something I buy often, because I usually find that unlike clothing that I sell often on Ebay or donate to charity at the end of a season, bags see me through the whole year round. I like to buy clutches, handbags and rucksacks that will go with a lot of my wardrobe, so statement colours aren't something I would go for in a bag. Stepping slightly out of the box, but still sticking to my 'goes with everything' theme, I picked up this pretty grey metallic bag with chain detailing recently. Again, I can see this matching so many outfits no matter the colour, but for this upcoming season, a silver clutch is perfect! Since I already own a clutch from Koko Couture (see me styling it here), I just know it's going to last. The quality is always fantastic & the price is super affordable too. Since the bag and jacket both had such intricate detailing, I decided to keep the rest of the outfit simple. I paired them with a plain tee from Sammy Dress, a black crochet skirt from Primark & my favourite over the knee boots that I picked up last year from Ebay.